Al het nieuws over en van Stichting Childrenshome wordt zorgvuldig bijgehouden. Nieuwe mededelingen betreffende de financiële adoptie en ondersteuning van de weeshuizen, dorpskinderen, projectverslagen, acties en persartikelen kunt u hier terugvinden. 1 november - All the children prepare the Christmas letters. We have invited all the children to prepare the Christmas letters. 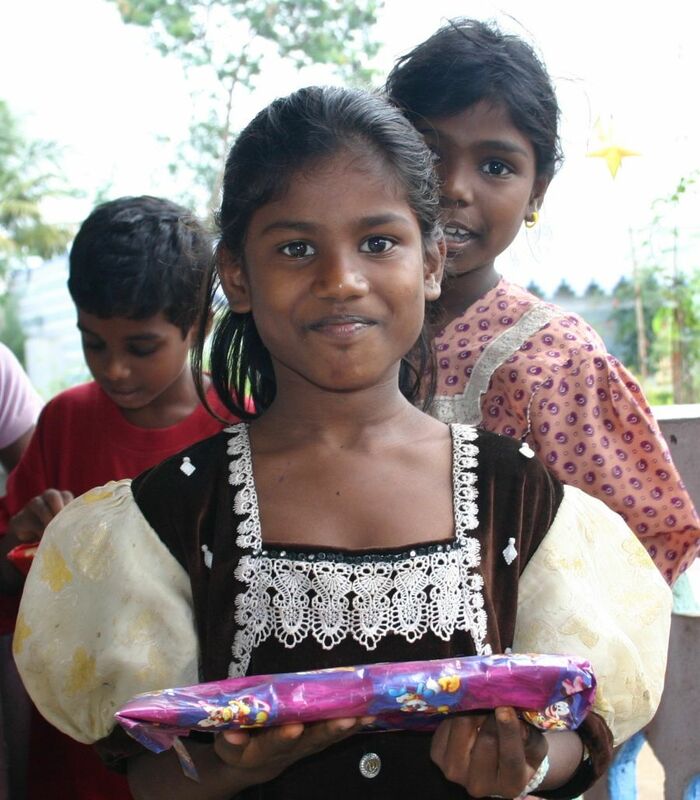 We have school bags ready to distribute and this will make them very happy. We will convey your loving greetings and wishes to them. We had a good Sunday with all adopt children. The children were happy to come and spend time with us. We informed the adopt children about Christmas and they were happy to know about it. We also informed about play ground and they were excited about it. It was a beautiful day for all children. 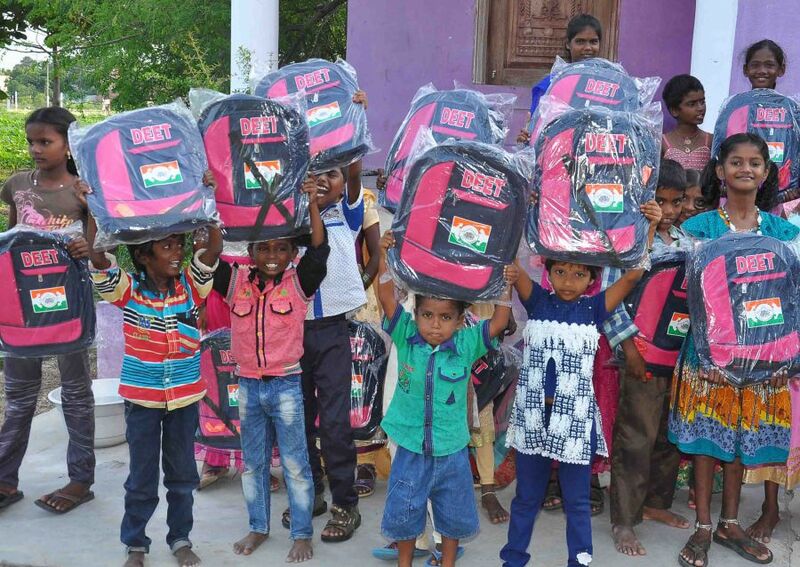 We made them very happy with new school bag. Please find enclosed a few pictures from the gathering. We thank you for making this available to help adopt children and their families. We are grateful to you and to all adopt parents for this kind contribution to improve the lives of adopt children. We are thankful to your love and support. 29 Oktober - Kerstactie Dongemond College Made. Traditiegetrouw organiseert het Dongemond College te Made een kerstactie voor een goed doel. Dit jaar is opnieuw gekozen voor de Stichting Childrenshome van Lia en Jan Mureau. De Stichting Childrenshome gaat de opbrengst van deze kerstactie gebruiken voor de aanleg van een speeltuin voor de organisatie DEET. Zodra er meer nieuws is komen we hier op terug. Dongemond College Made: heel hartelijk dank! Onderstaand bericht doorgekregen van Br. Sebastian over het belang dat ook meisjes gaan studeren! I recently read a management book in which the author describes management as the greatest life opportunity one can have; mid- to long - term success is no more and no less than a function of one’s dedication to and effectiveness at helping team members grow and flourish as individuals and as contributing members to an energetic, self-renewing organization dedicated to the relent-less pursuit of excellence. Looking at the development “The empowerment of rural women and girls are essential to building a prosperous, equitable and peaceful future for the planet” says UN secretary general Antoni Guterres. Educating poor girls and empowering poor women is not merely a social cause but a critical factor for economic empowerment. A recent McKinsey Global Institute report declares that girl’s education and women empower can add 12 Trillion to global wealth every year. If India achieve this push if could add 700 billion of additional GDP boosting GDP by 1.4 %. Educating poor girls and empowering poor women is thus the sure solution for many social and economic problems. Globally where the women are educated and empowered show better development indices and are better governed society more stable and are less prone to violence. 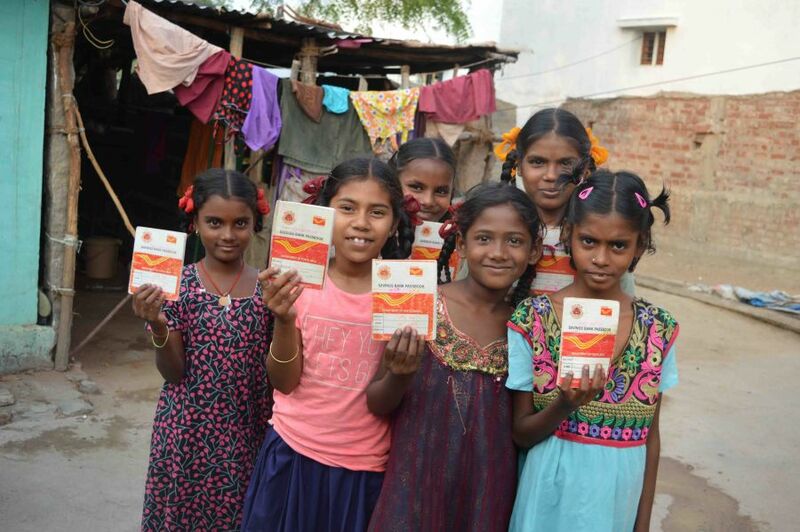 Our simple rural findings suggest that by educating a girl we not only help that girl but we empower a catalogs for change in her family and community. By not educating a girl in a family we lost an opportunity to impact a generation. When educating of a girl is missed we pave way for a broken generation. Of course we must realize that it is much more cheaper to educate a girl than repair a broken and disappointed generation. One recent research also say this that women in emerging markets reinvest 90% of their earnings in to human resource ie their family’s education, health and nutrition. Compared to this the research says that only 30% to 40% earnings of men go for these. SJDT is involved in empowering the future generation of women with two pronged approach. For the poor neglected and marginalized girls we provide shelter, food, clothing and education through our orphanages plus provide home based educational scholarships to rural poor girls. 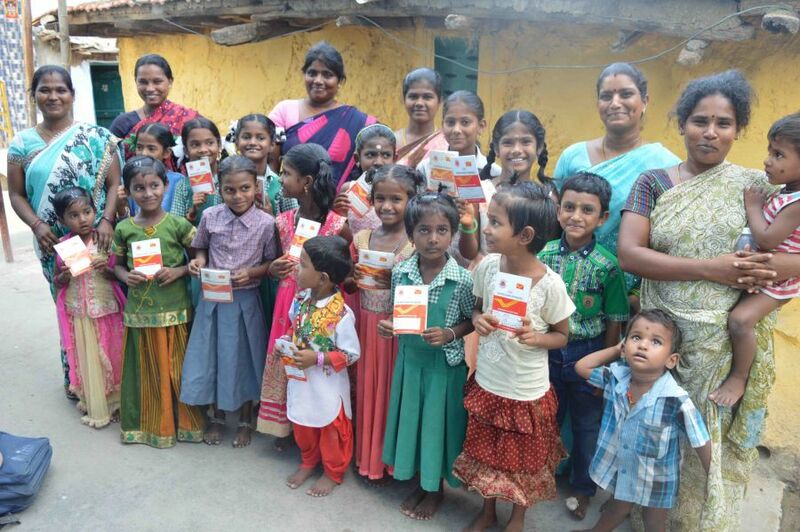 For the grown up rural poor women we provide micro loans by forming them in to self help groups. This way the women are able to start a micro business and bring an income to the family. SJDT is proud of its immance contributions in building confident women of future generation. We very much appreciate your cooperation to SJDT in full filling this noble cause. Greetings and prayerful wishes to you from Rev. Dr. Bro. I. Sebastian . 1- The triple talaque pronouncement is declared unlawful and crime as well and immediate arrest and vigorous imprisonment. 2-The second hallmark judgment is giving right to women to enter the most popular temple where women were prevented to enter. 3-The third hallmark judgment legalised sexual relationship between two consenting adults. A women committed suicide within few days of Judgment because the husband justified his illegal relationship outside his marriage. Now the above three Judgment are directly connected with women of India who so long time lived in oppression of a male dominated paternalistic society. 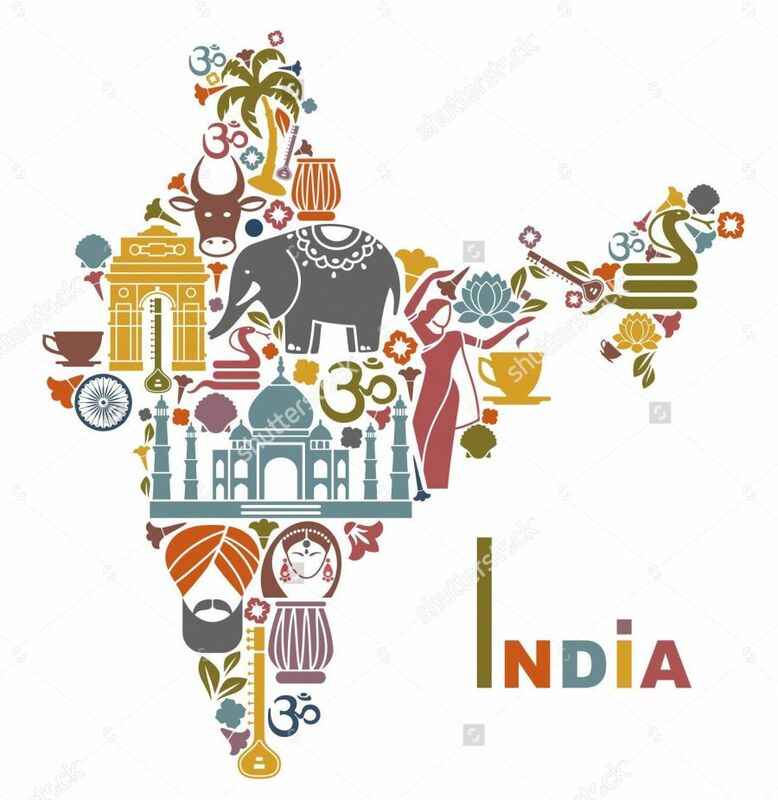 Women in India: Comes in all shapes and sizes; Takes many forms;Wears multiple hats; takes every kind under her fold; smiles through every hardship and remains a friend for life who impartsvaluable life lessons right since our childhood. In short, without her, our lives would simply not have been the same. Talking about that most important women in our lives i.e. THE MOTHER! We at St. Joseph’s Development Trust are very proud that we are educating and moulding and empowering so many of these women. In my next letter I will speak of the horror stories of sexual abuse in orphanages. 12 oktober - Kerstactie Childrenshome 2018! I am very well and having good health here, Now I am doing DMLT (Diploma Medical Lab Technician) at Kasi Hospital. I am very much like this study. Jan en Lia came to the hospital where I am studying and which made both of us very happy. I have introduced her to my colleges, they were also very much happy. I will work in the same hospital after completing the course. I gone to my native place where I seen my mother and sister and happy enjoyed with them. For your support me and my family were very much thankful to you. Oma Tine heeft bepaald dat na haar overlijden een gift uit de erfenis aan de stichting Childrenshome overgemaakt moet worden. Dit is inmiddels gebeurd en we willen de familie van oma Tine daarvoor heel hartelijk danken. De opbrengst van de Caritas collecte van 14 en 15 juli van de Vijf Heiligen Parochie heeft het mooie bedrag opgebracht van € 200,90. Veel dank aan iedereen die hier aan meegewerkt heeft . 27 augustus - Vijf financieel geadopteerde kinderen die hun studie hebben afgerond hebben nu een baan! Afgelopen schooljaar waren er vijf financieel geadopteerde kinderen die hun studie hebben afgerond. Deze kinderen zijn op jonge leeftijd financieel geadopteerd en de financiele adoptie is beeindigt na het behalen van hun diploma. 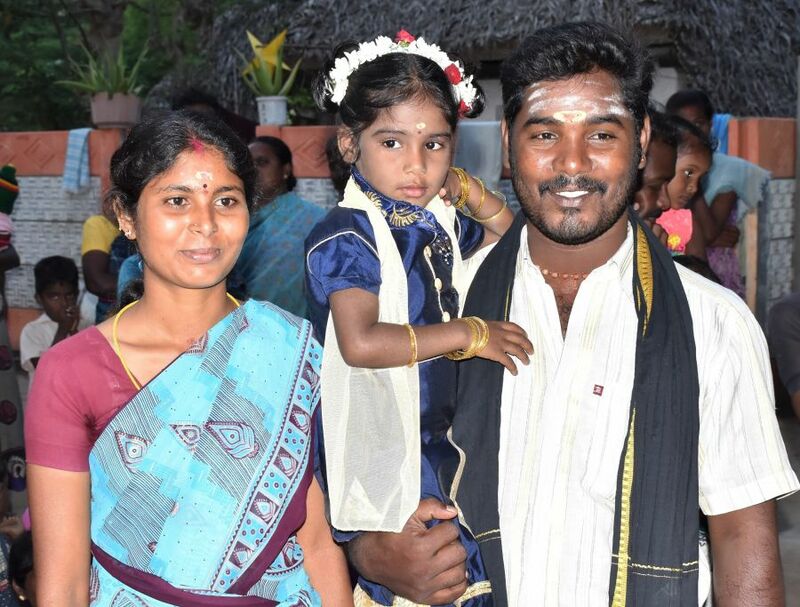 Karthika, Hema, Sivakumar, Kaliamal en Sivakami zijn de adoptieouders zeer dankbaar voor hun hulp. Ze hebben nu allemaal een baan en kunnen de toekomst met vertrouwen tegemoet zien. Beste adoptieouders, namens Childrenshome en SJDT heel veel dank. Met jullie hulp hebben we met z'n allen hun toekomst kunnen verbeteren! 27 augustus - Kleine kinderen worden groot, heel hartelijk dank voor jullie jarenlange ondersteuning. Op dit moment hebben we een aantal kinderen die als klein meisje of jongentje financieel geadopteerd zijn. Kleine kinderen worden groot, de kinderen hieronder zijn inmiddels 18 jaar en ouder en worden nog steeds financieel geadopteerd zodat ze hun studie kunnen afronden. Beste adoptie ouders namens deze kinderen, Childrenshome en SJDT heel hartelijk dank voor jullie jarenlange ondersteuning en dat jullie nog doorgaan met de ondersteuning! Greeting wishes from Dr. I. Sebastian, Executive Director of St. Joseph’s Development Trust, Genguvarpatti. However the implementation of this scheme has huge implications for the child care centres (orphanages). The scheme implementation implies lot of bureaucratic demands in terms of paper work and finances. I like to share with you some of these demands so that you can get an idea of what pressure we face. De afgelopen jaren heeft de regering van India richtlijnen uitgebracht onder de naam "De geïntegreerde kinderbescherming van de regeling". De Indiase regering beweert dat deze stap is om de VN-conventie over het recht van het kind (UNCRC) te vervullen. De implementatie van deze regeling heeft echter enorme gevolgen voor de kinderopvangcentra (weeshuizen). De uitvoering van de regeling impliceert veel bureaucratische eisen op het gebied van papierwerk en financiën. Ik deel graag enkele van deze eisen met u, zodat u een idee krijgt van de druk die we hebben. Lees hier het hele artikel. Graag willen wij iedereen bedanken die de afgelopen periode een donatie, al dan niet anoniem, hebben gedaan. Our new academic year has started on the first week of June. Ever since then we have received new admissions and some left. 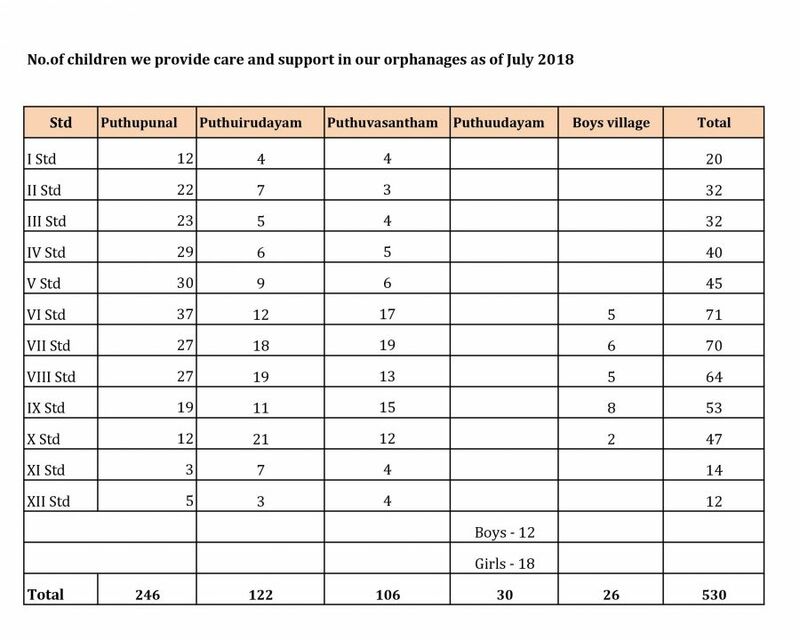 We are happy to inform you of our present number of children in our different orphanages we will be able to support these children by your generous support. I can eagerly awaiting your transfer of funds for the last quarter. Once again thanking you for all your support. De diaconale collecte in de kerken van de Vijf Heiligen Parochie op 7 en 8 juli is bestemd voor stichting Childrenshome, opgericht door Jan en Lia Mureau uit Made. Helpt u de stichting en daarmee de kinderen in India door uw bijdrage in de diaconale collecte? As of now we have finalized the final exam results of all our children in our orphanages. We are happy to share the consolidated result with you. We are very proud that almost all of our children passed through their examinations and moved on to their next level. We take this opportunity to thank you for all your support so that these poor children get good quality education. Graag willen wij Sanne en Joachim bedanken voor de donatie die Stichting Childrenshome heeft ontvangen. Van Jan Bochmann Architecten, een ontwerpbureau voor architectuur, interieur en stedenbouw te Amsterdam, een hele mooie donatie ontvangen. Jan, bedankt en we zorgen er voor dat de donatie goed gebruikt gaat worden. As I have informed you month of May is academic holiday for our school children. As most of our orphanage children going to the family for this holiday there are some complete orphan children who are brought by us from babyhood and they stay and enjoy the holidays with us. In total 48 of such children stayed with us and we organized some very useful programmes for them. I herewith enclose a report of the same. Once again thanking you for all your support. 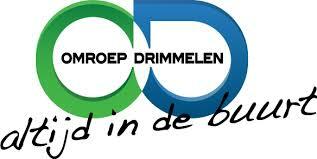 15 juni - Annual reports van SJDT en van Deet. Beste adoptieouders, vandaag hebben we de annual reports van Deet ontvangen. We gaan ze adresseren en volgende week gaan de annual reports van SJDT en van Deet op de bus. Een hele mooie donatie ontvangen in verband met de 50-jarige bruiloft van Bart en Ria. Bart en Ria, en alle gasten natuurlijk, heel hartelijk dank! 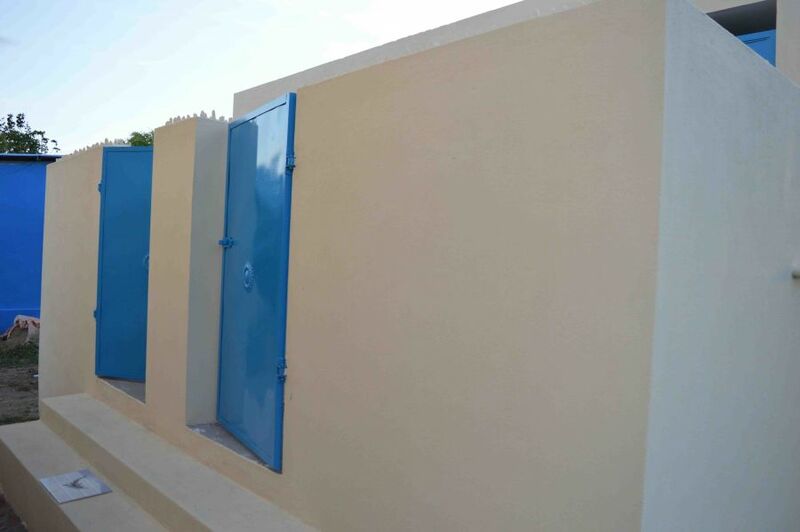 7 juni - We have opened the toilet facility for children. 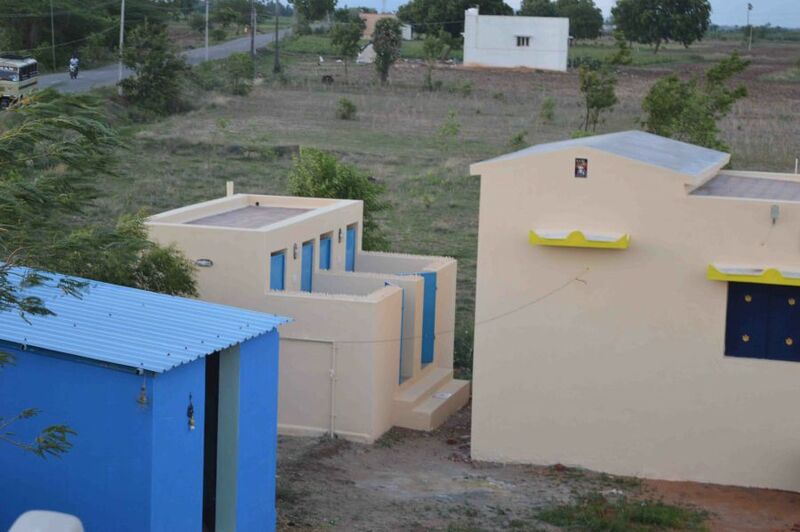 We are happy to inform you that we have opened the toilet facility for children. The children were happy to witness this facility for them. They were very happy to participate in the opening. 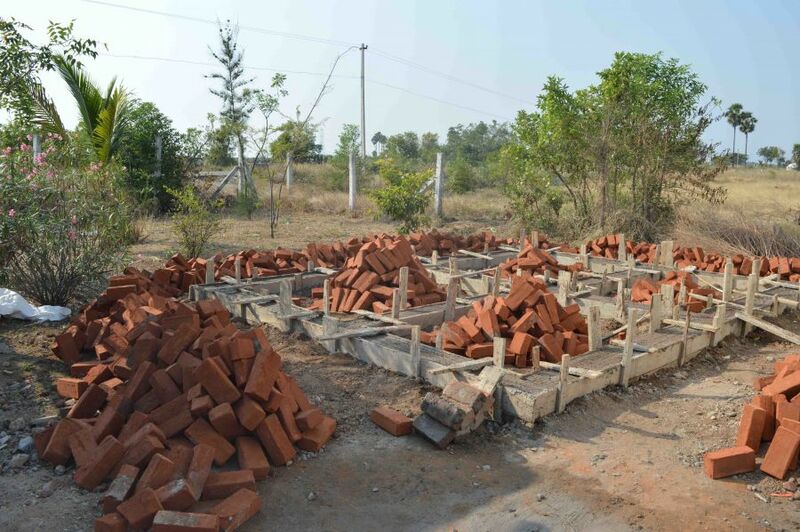 We are very grateful to Dongemond college students for their generous support to realize this project. It will be very useful for many children and women and will remain for several years. We thank all the students and teachers of Dongemond College for their contribution to realize this project. Follow the link to view a number of photos. We thank Bjorn in a special way for being the instrument to realize this project. we thank him for his efforts. We thank Childrenshome for making this project possible for DEET. We thank you for all your efforts. We wish you a fine day with much smiles and happiness. 4 juni - three days seminar for our staff who are engaged in our child care programmes of orphanages and village sponsorship support. As I informed you earlier we conducted a three days seminar for all our staff who are engaged in our child care programmes of orphanages and village sponsorship support. The course was organized by an internationally recognized child care specialist who also worked in Rome for seven years. The whole seminar was a rich experience for all our staffs. I have with enclosed a report for your perusal. 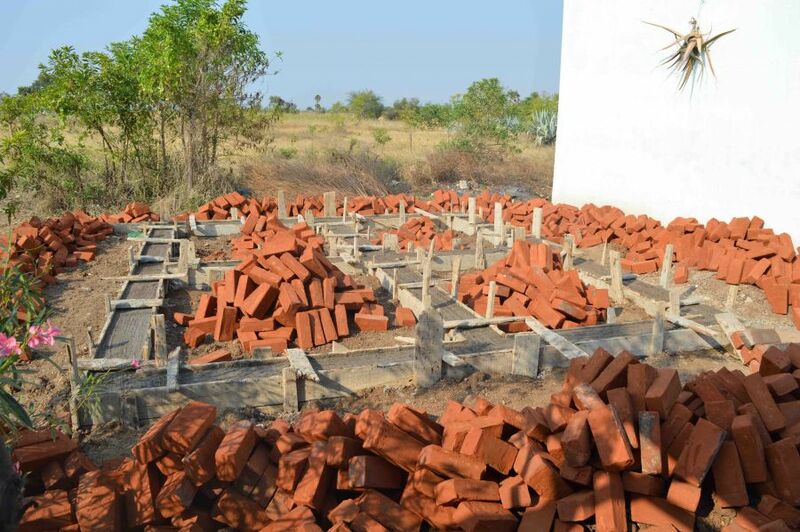 4 juni - The toilet building sponsored by the Dongemond College in Made is completed the construction!! 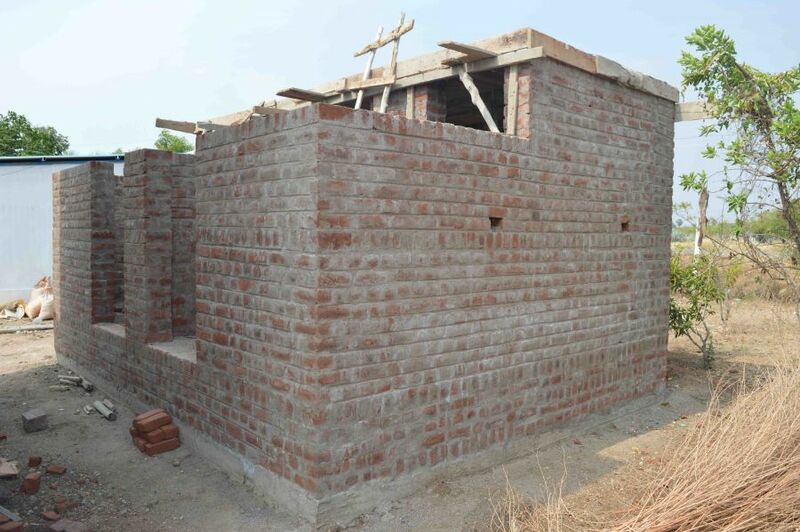 We like to inform you that we have completed the construction of toilet facility for children. It is very good facility for children and today we are going to have the opening. We are meet all the adopt children and wish them success for their schooling. The schools are opened yesterday. We will convey your sweet greetings to all children. Omroep Drimmelen, altijd in de buurt! Lia en Jan Mureau bekommeren zich al jaren over kinderen in weeshuizen in India. Zij hebben daarvoor de Stichting Childrenshome opgericht. Deze stichting heeft als doel financiële adoptie (adoptie op afstand) van weeskinderen en kinderen die door hun ouders in de steek gelaten zijn. Ook geeft de stichting financiële ondersteuning aan de weeshuizen waarin deze kinderen zijn ondergebracht. In oktober 2010 is de stichting ook gestart met het ondersteunen van kinderen die nog bij hun ouders of verwanten wonen. Wij gingen in gesprek met hen over dit bijzondere project. We willen jullie heel hartelijk bedanken. Jullie hebben er samen iets moois van gemaakt, kort en krachtig, precies waar het om gaat. 24 mei Omroep Drimmelen, altijd in de buurt!! 14 mei - Susmitha passed away. We bring a saddest news that our loving adopt child Susmitha passed away. She was undergoing dialysis on Friday and suddenly she had breathing trouble. She was rushed to emergency ward and offered intensive treatment. She was even given electric shock but the treatment did not help her and she passed away on Saturday. The body was handed over after hospital formalities and around 7 o clock in the evening her body was criminated in her village Kandai. It is a terrible shock for all of us who believed that she would be fine. We have not recovered from the shock. The family is in great despair and nothing can compensate their loss. Her mother has not taken any food for two days. We extend our maximum support and try to be with the family members. We invite you all to pray for the family. Let us pray that God gives them strength and courage to cope with the situation. Let us pray that God consoles the family members and be their strength at this difficult situation. We are deeply distressed over the situation and very sad for the family. We are unable to accept the fact that Susmitha is no more. In verband met de komst van de Algemene Verordening Gegevensbescherming (AVG/GDPR) die actief wordt per 25 mei 2018, hebben we onze algemene voorwaarden en privacy statement vernieuwd. 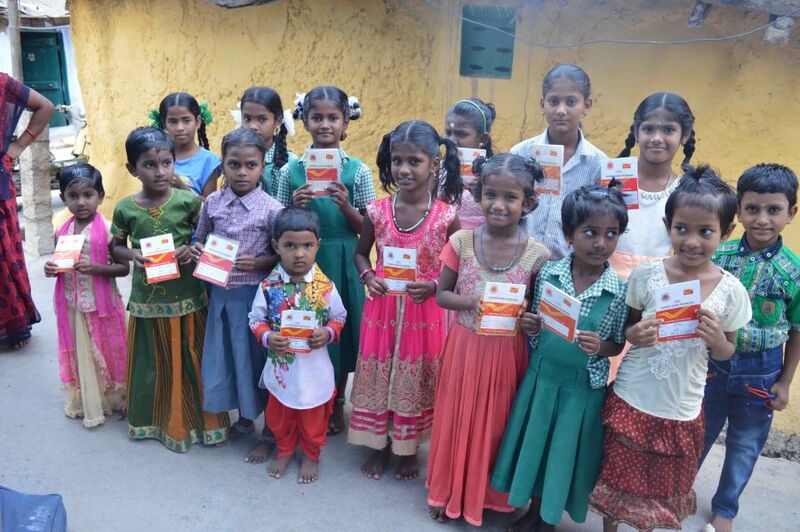 Herewith i share the pictures from distribution of passbook to adopt children. The adopt children and their families are grateful to your support and love for them. Beste mevrouw of mijnheer den Arend, heel hartelijk dank voor uw donatie! 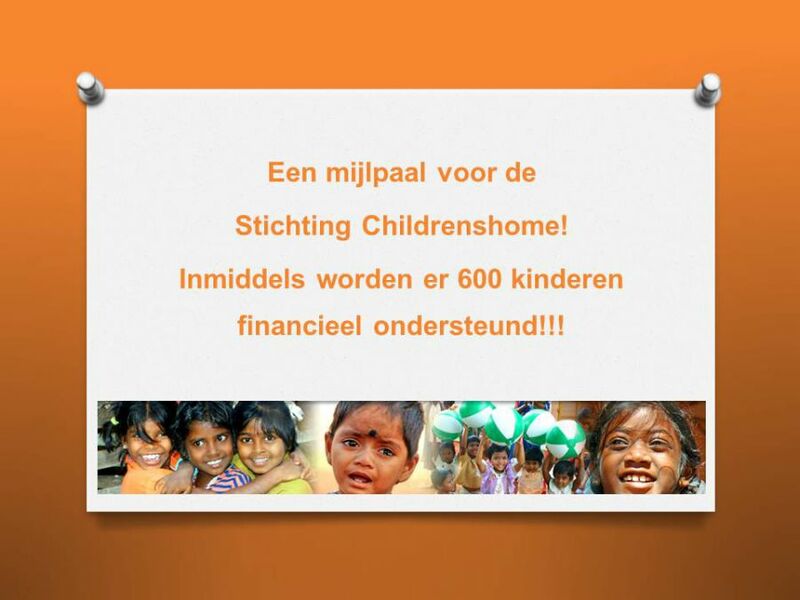 Omroep Drimmelen bezoekt vanavond Stichting Childrenshome voor tv opname!! We visited Susmitha day before yesterday and she has troubles again. As per the diagnosis report both the kidneys are damaged and not functioning. Susmitha’s urinary system and digestive systems are not functioning properly. The doctors’ team has advised for kidney transplantation. Blood samples are taken from parents and grandmother to diagnosis whether they are capable of donating kidneys. It will be two to three months process to transplant the kidney and until Susmitha has to undergo regular dialysis and treatment. When her parents and grandmother are not capable of donating a kidney then we have to register for free kidney and it is not easy to get free kidney donation and sometime it will take more than a year. The parents are worried. They are afraid whether kidney transplantation would help her to have a normal life. The parents are totally disturbed and distressed. Susmitha is conscious and she is aware of her condition. She has tears whenever she sees us. She is afraid very much. She wants to listen to music. We are very much disturbed about her condition. We are extending our best support for the family. We request you all to remember her in your prayers. She needs your love. We are happy to inform that there are signs of improvement from Susmitha. She is conscious and She is given liquid food through tubes. Her digestive system still not functioning well. The dialysis seems to be helping her and we see improvement. Let us continue to pray for her and wish her good. We speak to her mother often and extend our possible help. We visited her on Saturday and will meet her again on Tuesday. Thank you for all your support and love for Susmitha. De toestand van Susmitha is onveranderd. Ze ondergaat op dit moment dialyse en is buiten bewustzijn. Haar toestand is zeer kritiek. Wanneer de toestand na de dialyse niet verbetert moet ze een niertransplantatie ondergaan. De hele familie verblijft in het ziekenhuis en Antoni en Prema (Deet) bezoeken Susmitha dagelijks en bieden de mogelijke hulp. 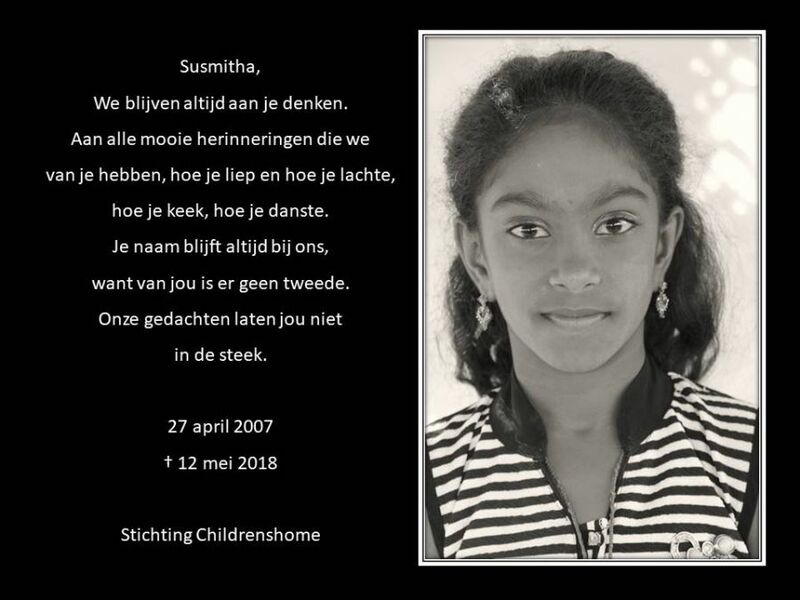 De moeder van Susmitha is de adoptieouder en Stichting Childrenshome zeer dankbaar dat ze bereid zijn om extra steun te verlenen. Elke hulp kan hun moeilijke situatie verlichten. Antoni en Prema bidden hun dagelijkse gebeden voor Susmitha en ze vragen jullie om ook voor haar te bidden. Alle kinderen uit het ondersteunings- programma Childrenshome/Deet en al de klasgenoten van Susmitha bidden voor haar. The condition of Susmitha continues to be same. She undergoes dialysis. She stopped taking food and she is in unconscious stage. Her condition is very critical still. When the condition is not improving after dialysis then she has to undergo kidney transplantation. Someone has to donate kidney when needed. The whole family is staying in the hospital and we are visiting her daily and offering the possible help. We are very grateful that you and the adopt parent are willing to extend some support. any little help can ease their difficult situation. We are offering our daily prayers for Susmitha and we request you to pray for her. All adopt children and classmates are praying for her. We very much hope that Susmitha will be fine and will be having a happy life. We will convey your greetings to Susmitha and her family. We hebben inmiddels contact met de adoptieouder van Susmitha. Het is zeer belangrijk dat dit meisje de juiste behandeling en medicatie krijgt. De adoptieouder en Stichting Childrenshome gaan dit gezin extra ondersteunen zodat Susmitha de juiste behandeling gaat krijgen. In gedachten zijn we bij Susmitha en haar familie. We hebben van Deet zeer droevig nieuws ontvangen. Ons adoptiekind Susmitha, 10 jaar oud, is zeer ernstig ziek. Haar nieren zijn besmet met zout en het is een ernstig probleem voor haar. Ze heeft hierdoor een zeer hoge bloeddruk. Ze is tussen leven en dood. Ze ondergaat dialyse. We bezochten haar in het ziekenhuis vanavond en er was een grote emotionele uitbraak van haar moeder en grootmoeder. We zijn diep verontrust over haar situatie. We hebben met de artsen gesproken en ze hebben geen positief antwoord. We zijn bezorgd en steken kaarsen voor haar aan. Er wordt veel geld uitgegeven voor haar behandeling. We hebben vanavond wat geld aan haar moeder gegeven. Veel steun is nodig om haar medicatie voort te zetten. Susmitha's moeder smeekt om wat extra steun. We vragen u om ondersteuning voor Susmitha. Wij zijn van mening dat een zeer intensieve behandeling haar leven mogelijk kan redden. De mensen in de dorpen Kandai en Sathangudi worden met dit probleem geconfronteerd. Het grondwater is erg zout en wanneer mensen het lang drinken, zijn hun nieren besmet met zout. Veel volwassen mensen worden met dit probleem geconfronteerd en soms worden ook de kinderen het slachtoffer. We zullen dankbaar zijn als enige ondersteuning kan worden uitgebreid om het leven van adoptiekind Susmitha te redden. We have a sad news. Our adopt child Susmitha is affected with a major health problem. Her kidneys are infected with salt and it is serious problem to her. She has very high blood pressure because of this. She is between life and death. She is undergoing dialysis. We visited her in the hospital this evening and there was big emotional outbreak from her mother and grandmother. We are deeply disturbed over her situation. We discussed with the doctors and they have no positive answer. we are worried and lighting candles for her. There is much money spent for her treatment. We have shared some money this evening. Much support is required to continue her medication. Susmitha’s mother is pleading for some extra support. We request you for some support for Susmitha. We believe that very intensive treatment can possibly save her life. The people in Kandai and Sathangudi villages are facing this problem. The ground water is very saline and when people drink it for long time then their kidneys are infected with salt. Many grown up people face this problem and sometime the children also become victim of it. We will be grateful if some support can be extended to save the life of adopt child Susmitha. 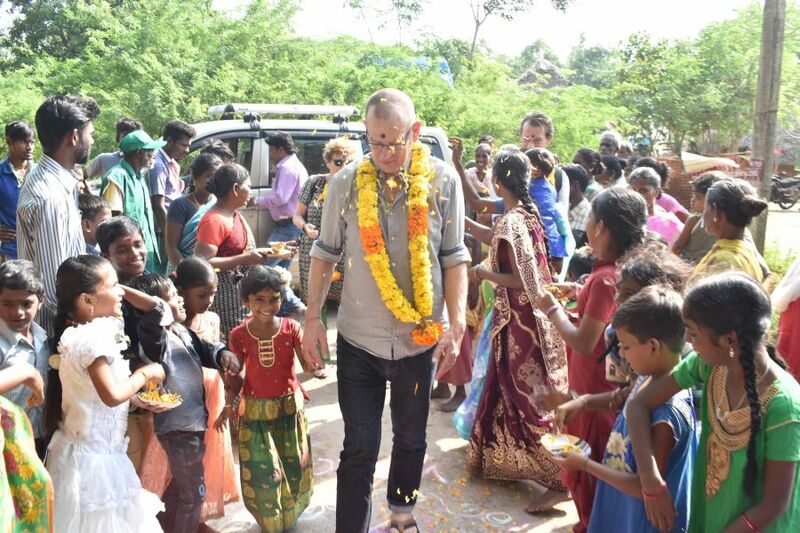 Van 20 april tot en met 1 juni hebben de kinderen in India vakantie. Deze periode hebben de stafmedewerkers van SJDT die de post verwerken ook vakantie. Zie onderstaand bericht wat we van SJDT hebben ontvangen. Greetings and prayerful wishes to you from Rev. Dr. Bro. I. Sebastian M.A., M.B.A., the executive Director of St. Joseph’s Development Trust, Genguvarpatty. I kindly request you to inform the sponsors that the children end their school academic year by the 20th of April and the school reopens only in the first week of June. During these days the staff take holidays in rotation and as well the children some of them may go with their relatives for few days. So reply to sponsors for parcels arriving these days may be delayed. I thank you for your understanding. 22 maart - The best students of the year 2017-2018 from the respective orphanages. We had an interesting process of selecting the best students of the year from the respective orphanages. We invited children to first nominate the candidates. Then we asked all children to give the positive qualities of these nominees. Then based on the good qualities we invited all children to vote for the nominees. After the voting we selected the best students from each orphanage. Here we present these achievers with mentioning only selected qualities given by all children. I hope you find it interesting. 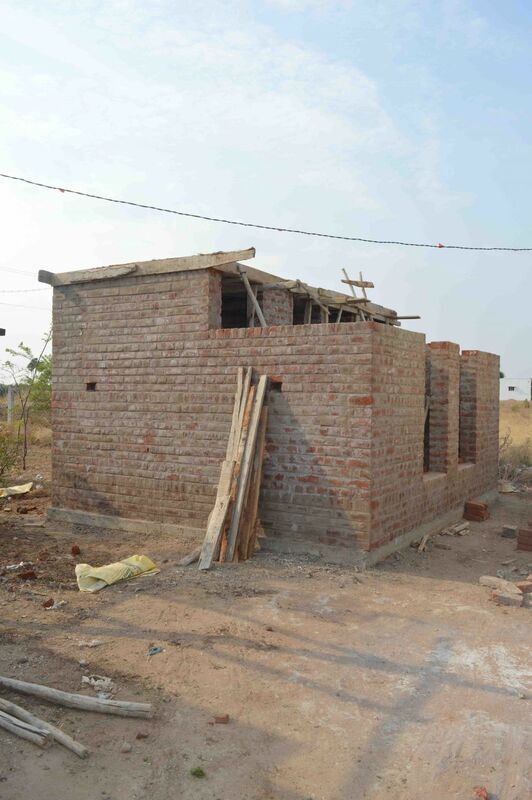 Herewith sending a few pictures from toilet construction, the work has progressed upto roof level. Roof concrete work is carried on Thursday and it will take 10 days for curing. We need to continue with cement plastering works, floor works and fittings works, etc. 15 maart- FOTOALBUM AANGEBODEN DOOR SJDT. Van ons bezoek aan de organisatie SJDT zijn er leuke foto's gemaakt door SJDT. Hier hebben ze een mooi album van gemaakt dat we graag met jullie willen delen. Klik op de link voor de album. As you now our children are under tremendous pressure preparing for their Annual Examinations. 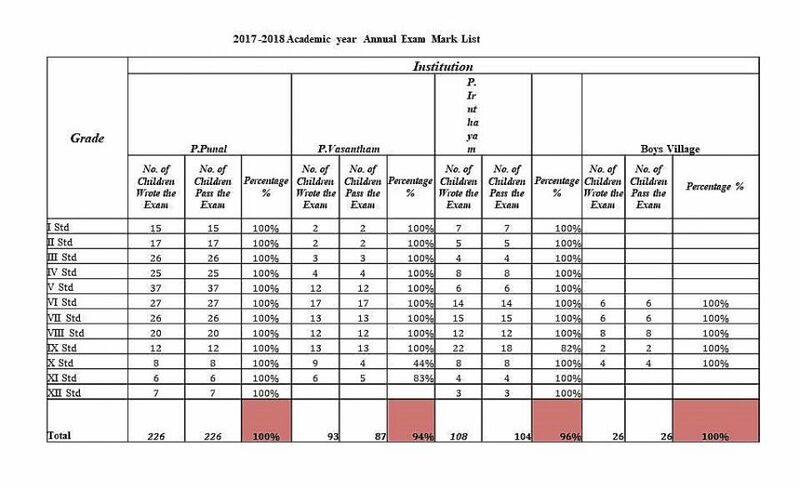 Especially the 10th, 11th and 12th grade girls face Government Public Examinations and it is based on this mark they can go on to next university level studies. Follow the link to read this. 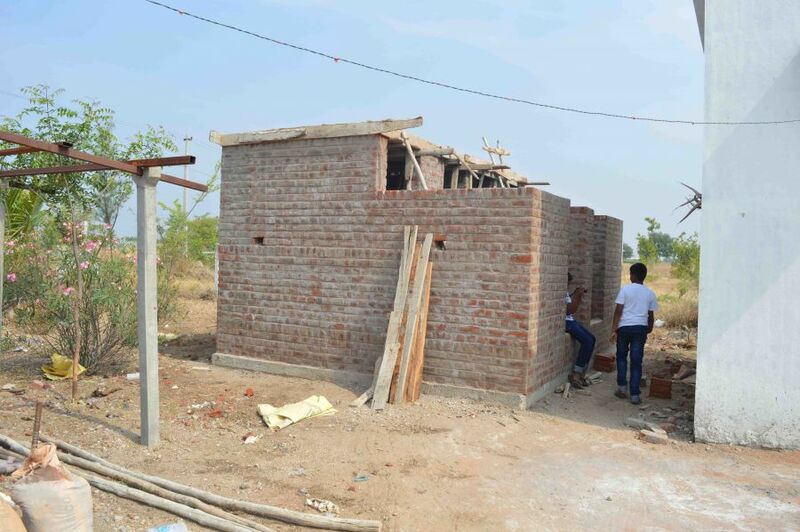 We like to inform you that we have started the foundation works for toilet construction. 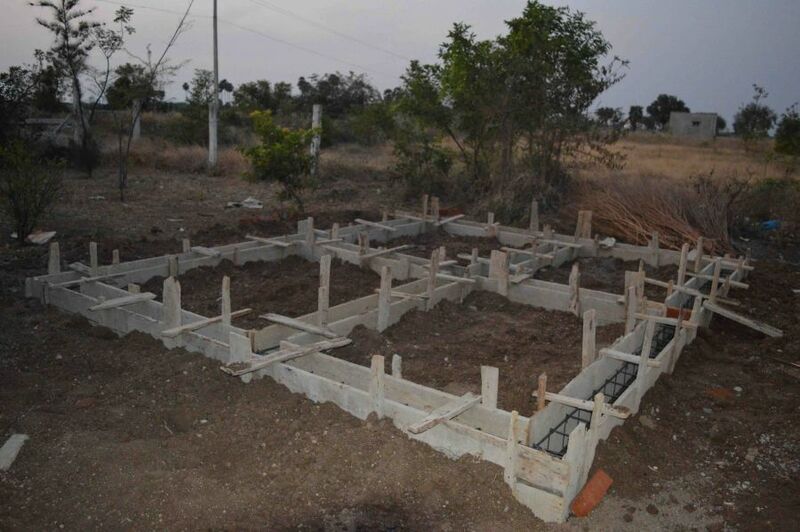 The foundation is dug for 2 feet and piled with mixture of metal stone, cement and sand and above it a concrete belt is made with iron bars and mixture of metal stones, cement and sand. 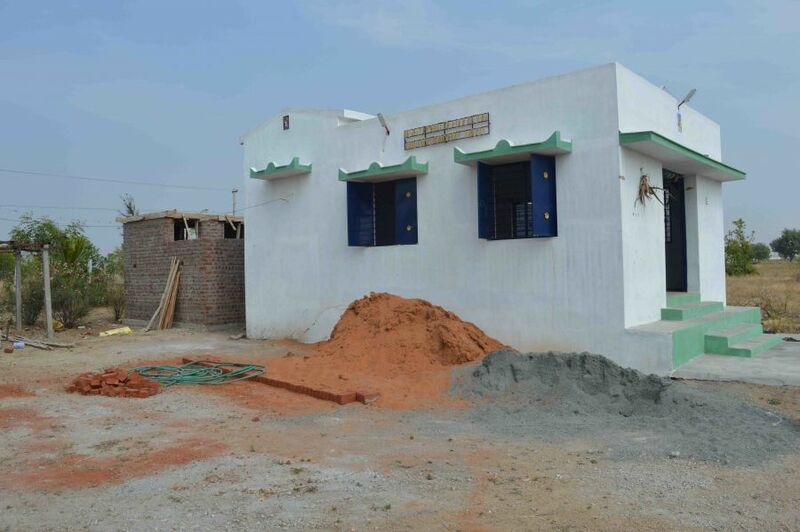 We have purchased all the materials ready to speed up the works in the coming week but we have to give enough time for curing and setting of cement mixture and bricks. For your information enclosing a few pictures. India is known for its Democracy when it is politically seen. The people of the nation are given full freedom to choose their own leaders and own the country. In India, politics has become another field of acquiring wealth and fame in real quick time. In the recent past even cine actors have started their own party and entered into politics. It is very obvious in our state, Tamilnadu. Often time people of Tamilnadu vote for their favourite actors because they him/her. Follow the link to read this article. 8 februari- A real picture of India’s Children status. Greeting and wishes from Dr. I. Sebastian, Executive Director of St. Joseph’s Development Trust, Genguvarpatti. I am just sending you a write up giving you a real picture of India’s Children status. In spite of all riches and fast growth of Indian economy yet the many children are still starving and malnourished. Follow the link to read this article. Ons bezoek dit jaar is weer heel goed verlopen. Alles wat we gedaan hebben is terug te lezen op de reisblog Childrenshome. We weten in ieder geval dat er in de weeshuizen goed voor de kinderen gezorgd wordt en dat ze niets tekort komen. Ook voor de dorpskinderen hebben beide organisaties alles goed voor elkaar. We willen wel nog even terugkomen op de fantastische opbrengst van de kerstactie. Dankzij alle gulle gevers hebben we de kinderen een setje kleding en schooltassen kunnen geven. We hopen ook voor de volgende kerstactie een beroep op jullie te kunnen doen. Tijdens ons bezoek hebben we met Br. Sebastian van de organisatie SJDT en met Antoni en Prema van de organisatie DEET over verschillende punten gediscussieerd. In onze eerstvolgende nieuwsbrief zullen wij hier uitgebreid op terugkomen. We willen alle financiële adoptie-ouders en sponsors heel hartelijk bedanken voor de steun van het afgelopen jaar en hopen dat we ook dit jaar weer op jullie kunnen rekenen. 7 februari- Twee adoptieouders bezoeken Pudhu Irudayam. We hebben echt ongelooflijk leuke dagen gehad in het Kindertehuis Pudhu Irudayam. De communicatie met Dhr. Suresh verliep erg goed. We werden keurig op tijd opgehaald bij het hotel en afgeleverd bij het kindertehuis. Daar werden we welkom geheten met bloemen en een stip op ons hoofd en kregen we direct thee en lunch aangeboden. middags bezochten we het Deense fort, de heerlijke oceaan en proefden we suikerriet sap. Daarna weer terug bij het kindertehuis heb ik nog even alleen met Prasanna gepraat en haar nog een cadeautje gegeven. Ook voor de andere kinderen hadden we wat meegebracht en uitgedeeld. De dag was zo vol want we hebben ook meegedaan met de spelletjes middag, zaklopen, waterspellen etc. ieder zijn eigen team. Het was genieten! Kortom het ontbrak ons aan niets en grote pluspunten ook voor de gastenkamer want het was de schoonste plek en beste bed wat we tot nu toe in India hebben gehad. Avonds werd er voor ons gedanst en hebben wij nog wat gezongen. Ik zit hart te denken of ik nog min punten of tegenvallers kan bedenken? Dat ons bezoek veel te snel voorbij is gevlogen. En onze grote dank is toch wel voor Dhr Suresh die alles in goede banen heeft geleid en alles in het tamil heeft vertaald. We hebben hem al bedankt maar misschien willen jullie dat ook nog doen? dat we zo lovend zijn over hoe alles is verlopen. En ook tegen de oprichter/baas van het kindertehuis. Bedankt voor alles. The above mentioned quote clearly tells us all how important it is celebrate our birthday. Our birthday celebration reminds us of our purpose in life. Everyone is born for a reason and fulfill certain destiny which can never be replaced by anyone else. The occasion of birthday celebration gives us all chance to thank the beautiful life we are blessed with and gives us a feel of becoming elder and wiser. On considering all the reasons one could understand how vital it is to celebrate birthdays. 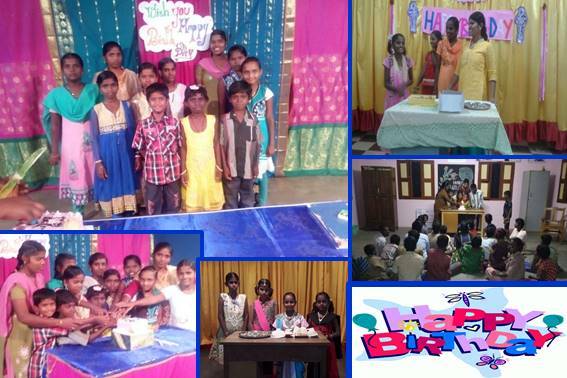 As you know very well that the children we have in our institutions are from very poor background and seldom had they chances to celebrate their birthdays before coming to the institute. When they see other children who come to school from their houses and when they celebrate their birthdays our children tend to get the feel that there is no one to care for them. There is no one to celebrate their birthdays. 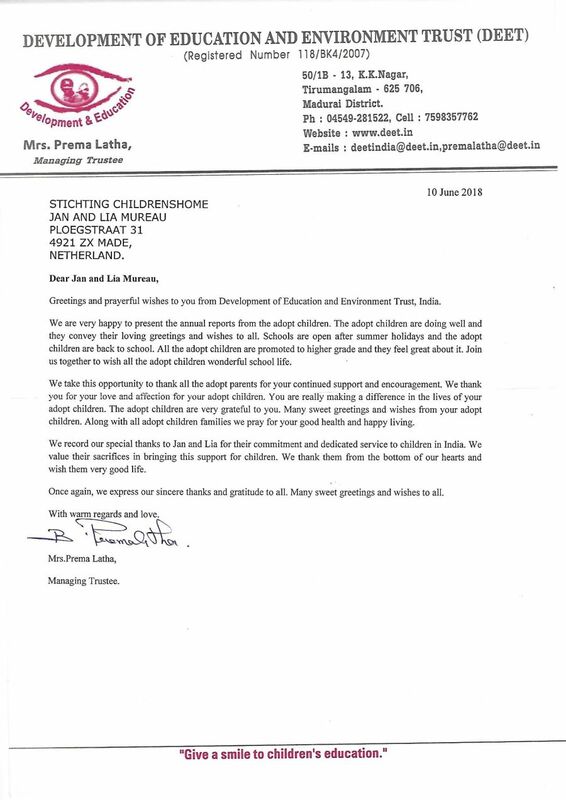 We observed that and wanted to confirm them that St. Joseph’s Development Trust always cares for them. So we started celebrating the children’s birthday in our institute. On the last date of a month the children who celebrated their birthdays in that particular month are called together and they celebrate their birthday in the midst of whole children. They wear new dress and adorn themselves with flowers and make up. The smile we get from them on that day would not equalize with any sort of happiness. Such will be their joy and happiness. Through this celebration they feel loved and experience tremendous confidence about their lives. We could sense a change in them all after the celebration. They start loving themselves and the others too because some of them had a negative idea about relationship, friends and neighbors as they did not have proper family situation. This birthday celebration does definitely change them a lot and get along well with others a lot. The celebration makes them feel special. Usually the celebration starts at 07:00 PM. All the children are assembled in a common place and the celebrants are invited in front. All of them blow the candles that are lit on the cake. Then they all cut the cake and give to each other and greet one another while the rest of them sing birthday songs joyfully. Once the celebrants finish greeting one another they distribute chocolates to all the children. The children organize special prayer service before cake cutting for welfare and educational progress of the celebrants. We witness vast change and happiness in the lives of the children through this practice. It keeps them motivated to achieve their goal and feel loved. We are so happy to keep these children happy with all ways and means. Since we find this program to be more effective to keep these children happy we continue doing it. Eventually it is with your great support we are able to do all the activities and organize such programs for the welfare of the children. The children who reside in our entire institute and those who work the betterment of these children warmly thank you for all your benevolent support and hope you would keep extending your support in the coming years too. € 10.973,00 IS HET FANTASTISCHE RESULTAAT VAN DE KERSTACTIE 2017!!! ALLE GULLE GEVERS, OOK DE ANONIEME NATUURLIJK, HEEL, HEEL HARTELIJK DANK. Met dit bedrag hebben we alle kinderen een setje nieuwe kleding kunnen geven en een “schoolbag”. Dankzij de bijzondere mooie opbrengst hebben we voor alle kinderen ook nog iets extra’s kunnen doen, fruit, cake, snacks, ballonnen, uitstapje.